A furnace for smelting of holding the temperature, in which the metal or alloy to be melted or kept hot is placed in a crucible. Depending on the operating temperature and the type of metal to be melted / kept hot, the crucibles used are either graphite crucibles (additional glazing coat and containing clay), silicon carbide crucibles (SIC crucibles), or crucibles made of cast iron, special cast iron, cast steel, or sheet steel (particularly for magnesium and zinc alloys). Mobile and fixed crucibles: the latter form an integral part of the furnace and are predominantly used in crucible induction furnaces (s.a. induction melting furnace). These kinds of furnaces are emptied by tilting the entire furnace. Crucible furnaces operated by means of resistance heat or fuel heat: In this case, the crucible is a separate unit and is inserted into the furnace. It may be replaced if required. Fuel-heated crucible furnaces are fired using gas or oil; whereas gas-firing is preferred nowadays. These types of crucible furnaces are described below in more detail. 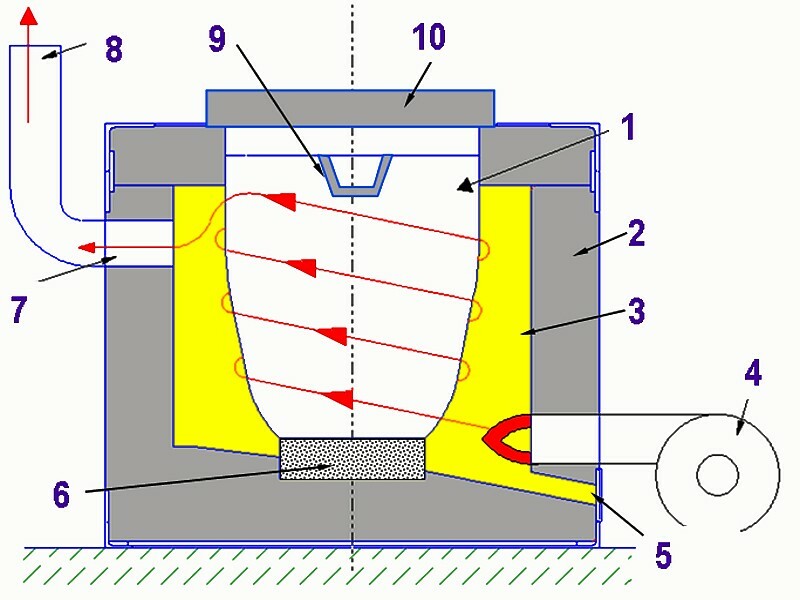 Tiltable and fixed crucible furnaces: resistance heat or fuel heat-operated crucible furnaces are designed such that the melting crucible remains in the furnace and the molten metal is emptied either through tilting of the entire furnace or by removing the material using a pouring ladle, e.g. in ingot or die casting. Figure 1 shows a schematic illustration of a gas- or oil-fired crucible furnace. The crucible (1) is supported by a cylindrical refractory base (6). An opening in the bottom of the furnace (5) provides the possibility of tapping the furnace in case of crucible breakage and pouring the molten metal, e.g. into an emergency accumulation pit. The gas or oil burner is attached at the side of the furnace shell together with the blower (4). The firing compartment (3) is lined with refractory material (2) and is normally closed towards the top by means of a swivelable lid (10). The swivelable lid also results in energy saving during holding operation and minimization of head dissipation losses through the molten bath surface. The flue gasses circulating the crucible are vented to the ambience or towards the stack (8) through an exhaust channel at the side (also referred to as flue (7)), so that only minimum occurrence of hazardous substances at the work-place are ensured. The furnace is tiltable and can therefore be completely emptied through the pouring lip (9). Crucible furnaces with exhaust gas venting through the crucible edge are only rarely used today; in these furnaces the flue gasses escape through a hood above the crucible. With this mechanism, there is a risk that the flue gasses come into contact with the melt, which may have a negative influence on the melt quality and, in addition the pollution load at the work-place is far greater. Removal of the melt from the furnace usually takes place with transport or pouring ladles. 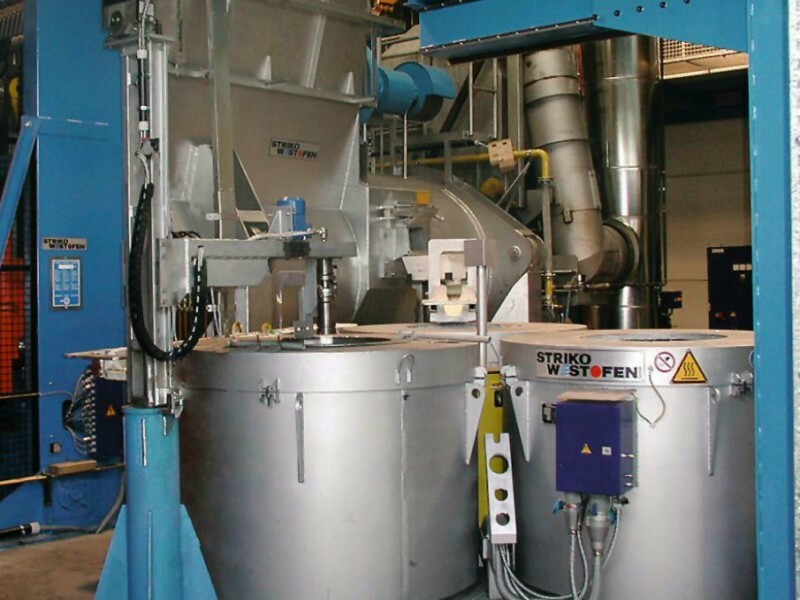 Tilting furnaces may be used both for melting of ready-to-cast metals and for pre-melting; however, their major field of application is in foundries for non-ferrous metal casting. The fixed crucible furnaces used as melting device in aluminum die casting foundries generally have a capacity of up to 1,000 kg, tiltable furnaces are available with capacities of up to 1,500 kg. For heavy metals there are also furnaces available with even greater capacities. The melting output is approx. 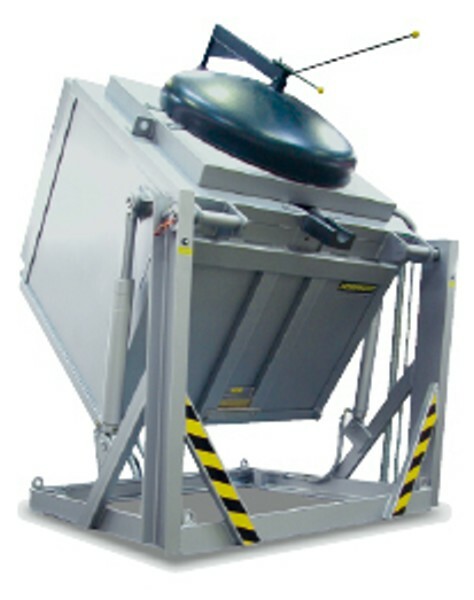 250 kg Al/h with electrical heating and up to approx. 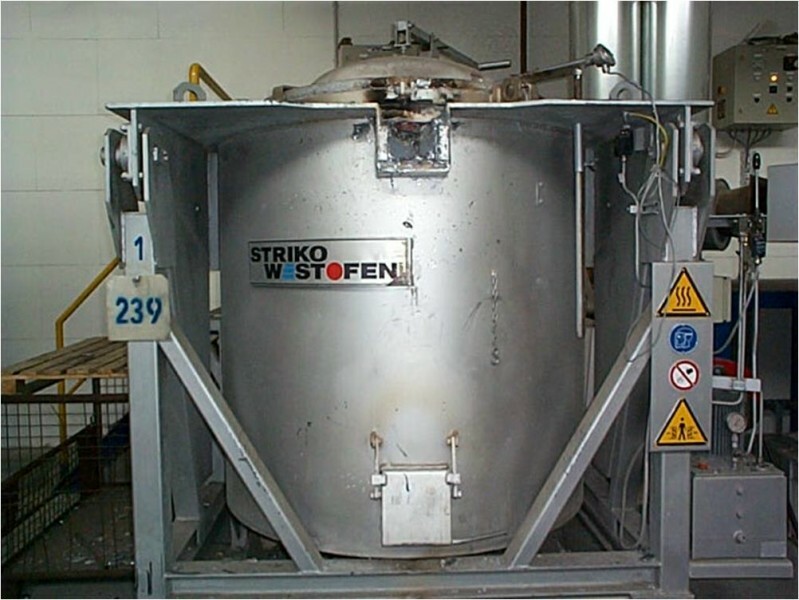 400 kg Al/h with fuel heating models (specifications according to StrikoWestofen GmbH). Fixed, non-tiltable crucible furnaces are mostly used as holding and bale-out furnaces in ingot and die casting foundries (Figure 2). Although they are also suitable for melting of cold material, they should exclusively be used as holding furnaces since this is the only way to prevent temperature variations in continuous operation. Particularly in ingot and die casting it is extremely important to keep the casting and holding temperatures of the melt at a constant level. Subsequent addition of cold charge metals into the ready-to-cast hot melt will in any case cause a temperature drop, which may have a detrimental effect on casting. Therefore, holding furnaces are generally charged with pre-melted metal and are equipped with automatic temperature control. Separately positioned, tiltable crucible furnaces equipped with a recuperator burner as shown in Figure 3 are best suitable for pre-melting; recuperative pre-heating of the combustion air achieves great fuel savings in a range between 25 and 38 %, as opposed to cold air burner systems. Hearth-type furnaces are also used for pre-melting of large metal quantities. Figure 4 illustrates a tilting frame furnace with replaceable holding furnace. With fuel firing the energy consumption per ton of melting material does not only depend from the design of the furnace and the size of the crucibles. 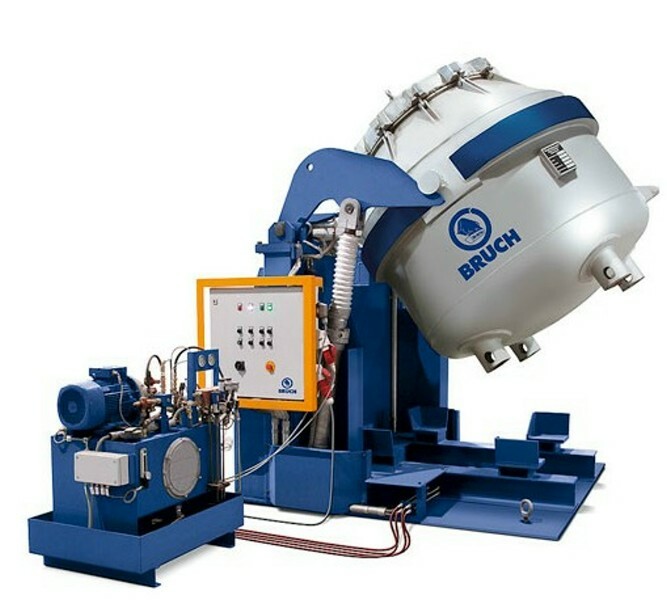 Precise adjustment of the crucible to the size of the furnace compartment, correct burner settings and the aging condition of the crucible also play a major role. With cold air burners, approx. 130 to 150 mÂ³ of gas are required for melting 1 t of aluminum to a temperature of 720 Â°C, depending on the crucible size. With electrically fired crucible furnaces around 400 kWh are required for melting of the same amount of the same material. Figure 5 illustrates a tiltable crucible furnace, including tilting frame and hydraulic unit, fired through electrical resistance. The thermal element (in Figure 5 it can be seen in the top right corner) for measuring and control of the melt temperature is equipped with a graphite protection tube within the bath. This design is also common in fuel-fired furnaces. For practical melting operation, the time required for melting of a complete cruciblecharge is also highly important in addition to the values for energy consumption in continuous melting. For example: the melting time in a gas-fired crucible with a volume capacity of 350 kg, which was pre-heated and filled with approx. 20 % of molten metal (liquid heel), is approx. 85 minutes. With an 800 kg crucible the melting time is 130 minutes, which is insignificantly more than for the small amount. If a cold crucible is used, the time required for melting may increase by up to 50 %. Electrically fired furnaces roughly require double the melting time compared to gas-fired furnaces. The advantages provided by crucible furnaces include ease of operation and maintenance and low investment costs. With an operating concept based on these types of furnaces, a foundry is also capable of melting small batches of various alloys. There are practically no limitations as to the type of alloy. The melt can be treated directly in the crucible and the alloy can be quickly and easily replaces as necessary. However, for higher production quantities application of crucible furnaces is not efficient any more. The main reasons for that are the relatively high specific energy consumption, on the one hand, and manual operation, on the other. Manual charging causes very high operational costs. Moreover, only completely dry metal must be used for subsequent charging, since wet charge material causes ejection of metal resulting in great risks for personnel.